Sinn Féin described the comments as “nonsense” and called for a more constructive dialogue on the issue. SINN FÉIN’S PROPOSAL to impose a 50 per cent tax on oil and gas profits has been dismissed by a Labour TD as “the ultimate display of leprechaun politics”. However, Sinn Féin hit back at the comments and called for a more constructive dialogue on the issue. McCarthy told the Dáil yesterday: “Sinn Fein’s suggestion that we should slap a 50 per cent tax on oil and gas profits as a means to produce long-term wealth in this country is unrealistic in the extreme. It is indicative of the type of leprechaun politics that they seem intent on pursuing in the House, and frankly their anti-EU dialogue is getting tiring. McCarthy accused the party of “whipping up the fears” of vulnerable people in Ireland and said that Sinn Féin should be coming up with more constructive ideas as part of a more honest approach to politics. It’s a nonsense comment given the amount of money that could be generated for the state if we properly explored this issue. He [McCarthy] is grasping at straws. It would be of more benefit to sit down and talk about how oil and gas could be exploited in interests of the country. 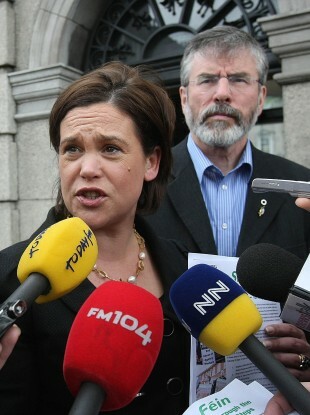 Email “Sinn Féin accused of 'leprechaun politics' over oil and gas profits policy”. Feedback on “Sinn Féin accused of 'leprechaun politics' over oil and gas profits policy”.